In August 10th 2018, the doctorate program of FEB-UGM conducted an open session of doctoral promotion in Auditorium of BRI, MD FEB-UGM building. On this occasion, the doctoral student in management Fitroh Adhillah was the one to be examined. Fitroh Adhillah is a lecturer of Ahmad Dahlan University, one of Islamic University in Yogyakarta. The open session of doctoral promotion was leaded by Nurul Indarti, Sivilokonom, Cand. Merc., Ph.D as the director of doctorate program in management. The team of promoter was leaded by Prof. Dr. Basu Swastha Dharmmesta, M.B.A., while Dr. Sahid Susilo Nugroho, M.Sc. and Bayu Sutikno, MSM., Ph.D. acted as a co-promoter. The members of examiner team was Dr. Jeanne Ellyawati, MM., Yulia Arisnani W, M.B.A., Ph.D., Dr. Bayu Aji Aritejo, MM., M.Si, and Dr. Anton Agus Setiawan, M.Si. 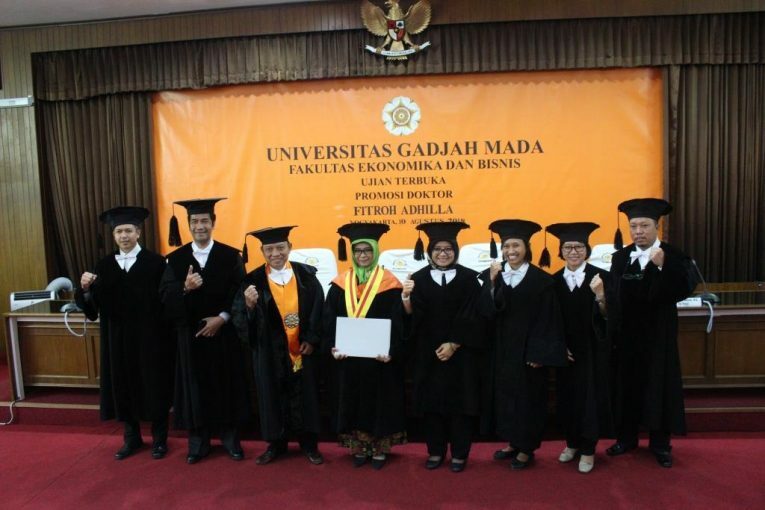 The dissertation of Fitroh Adhilla entitled “Antecedents of Brand Identification Model and its Effect to Consumer Behavior”. There are at least three gaps that be the main concern of the dissertation, which are classified as theoretical gap, methodological gap, and empirical gap. The theoretical gap is related to the concept of brand identification, where majority of previous study at the same topic focused on the cognitive aspect of the brand identification. The methodological gap is related to the instruments that measure the brand personality, where majority of previous study at the same topic considered less accurate. The empirical gap is related to the object of the study, where majority of previous study solely use the consumers of brand owner. Structural equation model (SEM) was employed to analyze the data, and the results find there are six factors that affected a member of brand community identify a brand, which are: brand personality, prestige, brand reputation, consumer satisfaction, public relation of the company, and social identity.